In the Maryland Senate, all of the incoming Democrats will be more liberal than all of the Republicans. But who are currently the most progressive of the 47 state senators? 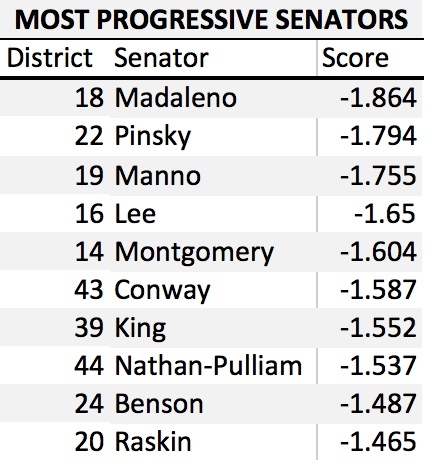 Using the same dataset provided by Boris Shor and Nolan McCarty of state legislator ideology mentioned in previous posts, the above table lists the most progressive senators. Remember that a more negative score indicates a more progressive senator. These scores are for the legislator’s entire career in the General Assembly and include House as well as Senate service. The most consistently progressive member of the Maryland Senate is Rich Madaleno, who represents District 18 (Chevy Chase, Kensington and Wheaton) in Montgomery County. Indeed, six of the most liberal senators represent MoCo–Madaleno (#1), Manno (#3), Lee, (#4) Montgomery (#5), King (#7), and Raskin (#10). Three of the others on the list are African-American women from Prince George’s or Baltimore: Conway (#6), Nathan Pulliam (#8), and Benson (#9). The final member of the list is Paul Pinsky, who hails from Prince George’s and is the second most progressive member of the Senate after Madaleno.